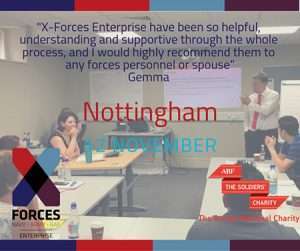 X-Forces Enterprise is running one of their award-winning Self Employment Discovery Workshops in Nottingham on 12th November. It’s free of charge for service leavers, cadets, reservists, spouses/partners, and veterans who are interested in starting a business. By the end of this one-day workshop you will have a better idea of what starting a business entails, and have a clear understanding of the support on offer, so you can plan your next steps. Learn more and book your free place online or call the team on 0800 368 9533. A follow-up workshop in Leeds will continue the learning and business planning support. X-Forces Enterprise has supported over 1,300 businesses in the Armed Forces community. This event has been supported by ABF The Soldiers’ Charity and is being hosted by Tesco. For any enquiries please call 0800 368 9533 or email X-Forces.